Sam Avey loved Tulsa, once remarking that he would rather be broke in Tulsa than rich anywhere else. Sam E. Avey was born in Kingfisher, Oklahoma in l895 and lived his early life in Cherryvale, Kansas. He spent six years traveling with theatrical stock companies (vaudeville) as a prop man and actor before returning to Cherryvale to enter the grocery business with his family. Moving to Tulsa in l924, he became involved in sports management and promotion in boxing and professional wrestling. He later formed Tulsa’s first professional football team and the Oilers ice hockey team. In l942, he bought the Tulsa Coliseum at Fifth and Elgin and made it the center of sports activities for Tulsa until it was struck by lightening and burned in l952. He also founded KAKC AM/FM radio station with studios in the basement of the Coliseum. Avey was well known for his support of children’s charities. Under his leadership, the Babies Milk Fund, which began in the depths of the depression, became one of Tulsa’s best-known philanthropic promotions with a benefit wrestling show each year. For years, Avey gave an annual Christmas party for as many as 9,000 of Tulsa’s children without regard to color or creed. He chaired the Oklahoma Santa Claus Commission providing Christmas gifts for orphans across the state. 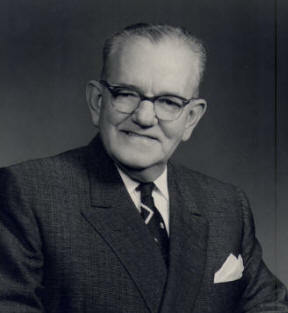 Avey served as president of the Downtown Rotary Club, the Chamber of Commerce and was one of the founders of F&M Bank. In 1958, he announced his retirement from all his business endeavors, but within a week he was behind a desk at F&M Bank continuing there until his death at age 67 in 1962.